If you are looking for a herbal‚ licorice-free supplement to provide stress relief‚ your search may end with Herbal HPA® from Dr. Wilson’s Original Formulations. This dietary supplement may relieve stress by promoting healthy function in the adrenal glands and other glands involved in the stress response. This formula from Dr. Wilson’s Original Formulations contains organic herbs which could optimize your stress response and calm your mind. Eleutherococcus‚ a species of small woody shrub‚ may aid the body in responding to stress. Ashwagandha present in this supplement may contain chemicals that could calm the mind and reduce stress. Maca‚ contains fatty acids and amino acids and may balance cortisol levels. This vegetarian liquid formula is free of licorice‚ artificial colors and flavors‚ corn‚ dairy‚ eggs‚ gluten‚ milk‚ nuts‚ preservatives‚ salt‚ soy‚ sugar‚ wheat and yeast. 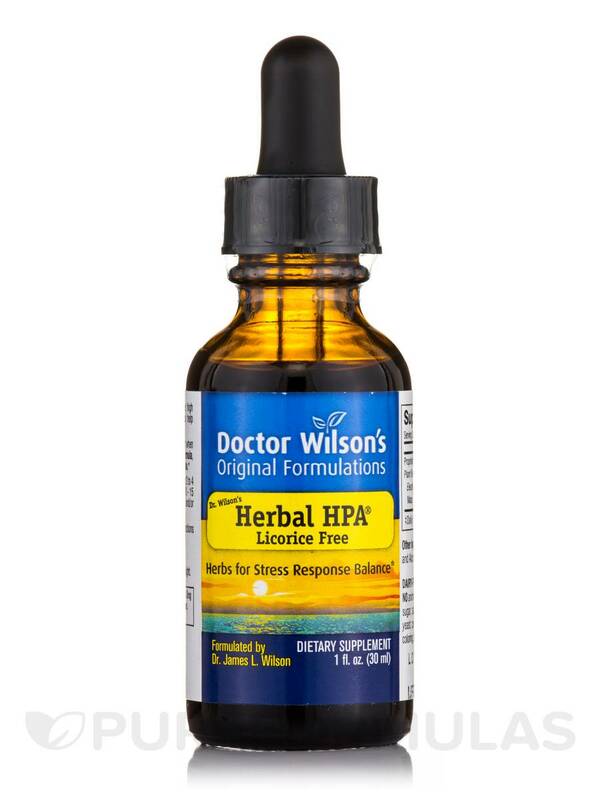 Switch to Herbal HPA® from Dr. Wilson’s Original Formulations for balancing your stress response. Other Ingredients: Purified water and alcohol (10%) from tinctures. Contains no animal products‚ milk‚ egg‚ sugar‚ salt‚ wheat‚ gluten‚ nuts‚ yeast‚ corn‚ soy‚ or artificial coloring‚ flavoring or preservatives. Take 10-15 drops in juice or water 2-4 times a day‚ preferably between meals or on an empty stomach (10-15 drops upon rising and 10-15 before bed; 10 may also be taken at noon and/or mid-afternoon‚ if desired). 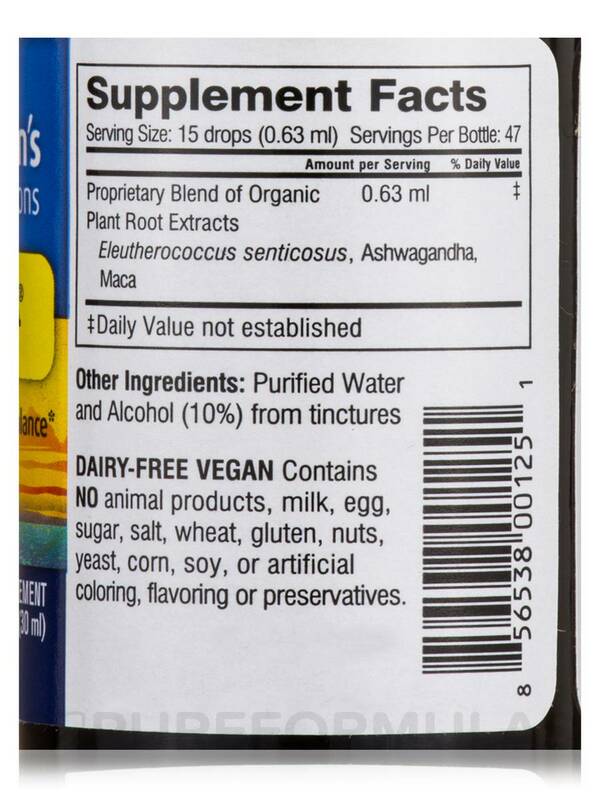 Note to people sensitive to alcohol: The herbs in this formula are liquid tinctures which are 25% alcohol. This method extracts the highest levels of active plant components for optimal benefit. People who cannot take any alcohol may add the recommended dose to 8 oz. of water and simmer for 10-15 minutes in a pan on low heat to evaporate the alcohol before drinking. 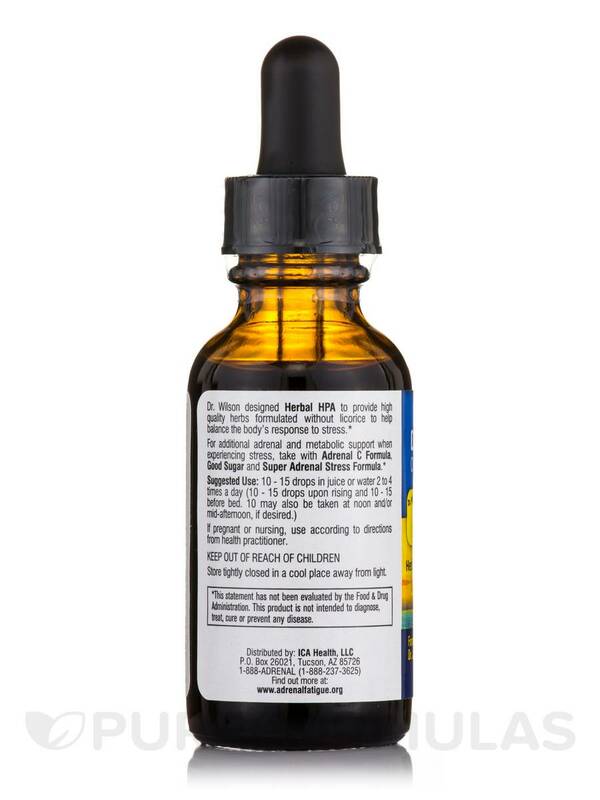 I am using Herbal HPA by Dr. Wilsons Original Formulations for adrenal fatigue symptoms. I've made so many lifestyle changes all at once, not sure which is helping most, but I am feeling much better. I got the licorice free because high blood pressure runs in my family and I did not want to chance it. Slightly alters the flavor of your water. 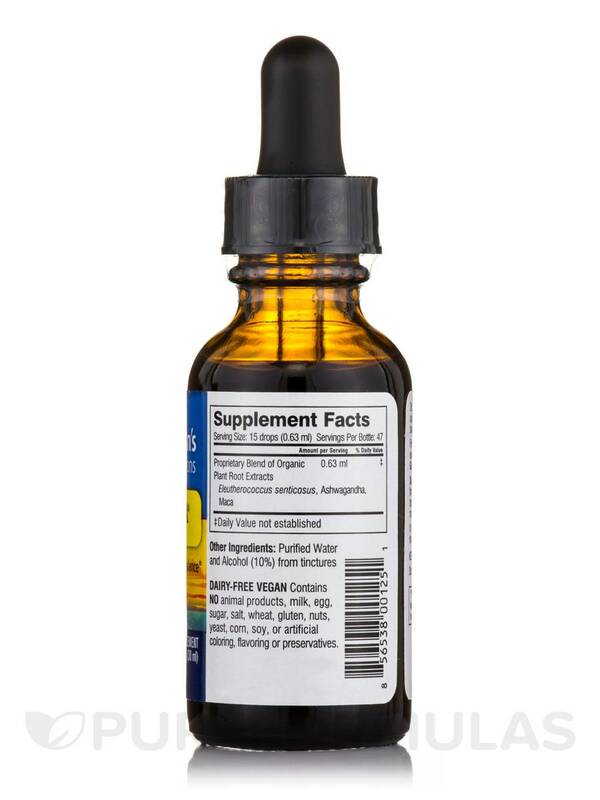 Herbal HPA by the famous Dr. Wilson is a trust worthy adrenal support liquid. It is extremely safe. 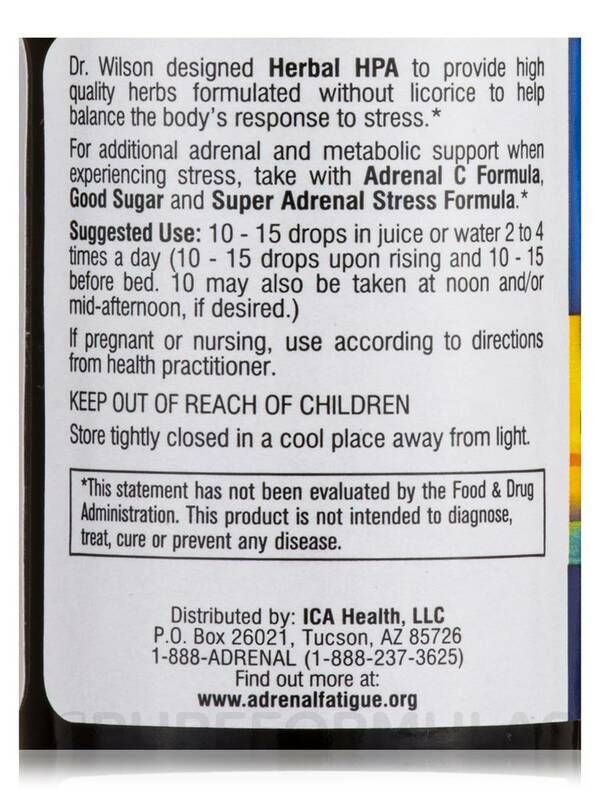 Used twice daily on a continual basis it helps keep adrenals healthy. I take Herbal HPA along with an adrenal cortex glandular. The licorice free version is a great option for people with high blood pressure. The combination of these two items has done wonders for my health. Sleeping better without sleeping pills better energy during the day etc. Your problem may be adrenal fatigue. I had never heard of this condition until my PA- Hormone Specialist mentioned it--and this product-- to me six weeks ago. Ten to fourteen drops in a small glass of water 4x a day. It has made a huge difference in my physical mental and emotional well being. She also suggested reading Dr. Wilsons book "Adrenal Fatigue." Found my symptoms listed there: Tired for no reason; difficulty getting out of bed in the morning (no matter how much sleep); feeling rundown and overwhelmed; no enthusiasm--more like depression--and many more. This product is worth trying! I started taking Herbal HPA by Dr. Wilson's Original Formulations and have been using it for six weeks. Amazing results for me. I have my energy and interest in life back! I have no problem remembering the dosage when I rise and when I go to bed at night but when my day is busy I sometimes forget the one at noon or the one at 3PM.